Leadership is not a position to obtain, nor is it a sense of power one must gain. It’s not a designation given to only a select few, and it’s certainly not about only the things you can do. Remember, you’re a human being, not a human doing. 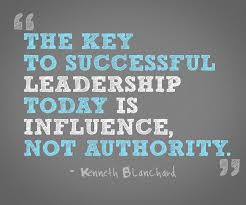 Leadership is, quite simply, your ability to influence others. It’s the invisible ripple effect that you create as a result of your being. Sadly, when I visit classrooms, I often encounter a large number of students who aren’t ready to own the fact that they influence. They are quick to list countless reasons why their peers are leaders, but when it comes to owning their own intrinsic leadership, the conditioning of their minds just won’t allow it in. Below is an excerpt from my book, Seriously, Dad?, which I invite you to read with your child, regardless of his/her age. The book is written as a conversation between a father and daughter, so you can even take turns reading the parts. Keep in mind that the content is not gender specific. My sincere hope is that the following dialogue will serve as a foundation for your child’s journey toward owning the fact that their ripple really does matter. Dad: You are a leader despite what others may tell you. This is precisely why I chose to start our conversation with this common untruth. In fact, if you are not able to embrace your own leader within, none of what I’m about to share with you will make an ounce of difference. Even though no one has labeled you as a follower, it’s natural for youth to shy away from the role of leader. The biggest reason for this is that a large majority of young people view leadership as a position of authority, which requires a certain level of power. You might identify your mom and I as leaders because we are “in charge” of the family and assume a certain amount of authority in that role. You might also view your teachers as leaders because they are “in charge” of the class and responsible for student learning. Do you notice a common theme in each of these examples? They are each examples of authority. It’s not the fact you may or may not be in charge of others that matters most. What matters most is the undisputable fact that you will always be in charge of yourself, and that alone makes you a leader. Leading yourself first is much more important than trying to lead others. This idea will serve as a foundation for everything else I share with you. Rather than trying to change you through manipulation or persuasion, which are examples of outside-in change, I’m interested in providing you with the tools to change yourself, which is called inside-out change. That’s a great question. Mom and I care deeply about your success in life and therefore our primary responsibility is to empower you, or give you tools that will help you along the way. Although it may seem like we are “in charge” of you when we ask you to clean up your room or finish your homework, the fact remains that you still have the power to choose your response in any of these situations. Therefore, while we may be in charge of the circumstances, we will never claim to be in charge of you. We’ll talk about that later. For now, let’s focus on helping you to embrace your inner leader. Yes, in fact I have the perfect metaphor that will provide you with a much different perspective. Think about the last time you dropped a coin in a water fountain, or threw a rock in the river. What happened when the coin or rock landed? The impact of the object created a ripple that extended far beyond its original insertion point. Well, you and I are no different than the coin or rock. Every time we “say” or “do” something, we create an invisible ripple around us. I would argue that our ripples are strongest when we focus on our actions, not necessarily our words. Simply put, wherever you go your ripple follows. Remember what I just said? Your ripple follows you everywhere you go and it extends well beyond the individual(s) you might have influenced. So, while you might think that your choices only affect a small number of people, the difference you might make for one person could translate into positive change for the people in their lives as well. Let me give you an example. Imagine that you show up to class on a Monday morning with a giant smile on your face. Meanwhile, the majority of your class is battling the Monday morning blues and already thinking about the end of the day. Your smile happens to capture the attention of one of the students and he/she begins to smile as well. Did you know that neuroscientists have actually proven that smiles really are contagious? Well, your smile could very well be the start of a thousand other smiles. I’m glad you brought that up. One way to address this would be to “tell” everyone to smile, which will more than likely be greeted with feelings of defensiveness. This is an example of the “outside-in” change I was referring to earlier. Needless to say, it’s not an effective approach. The other way to address this situation would be to continue smiling, knowing full well that someone is going to be influenced, regardless of whether they actually smile back or not. This is the true essence of “inside-out” change. If you think about some of the greatest leaders in history (Martin Luther King Jr., Ghandi), they weren’t concerned with changing others through force or control, they placed all of their energies on changing themselves, knowing that their influence would ultimately create positive change in others. If you’d like to order a signed copy of my book for a loved one, please email me at mike@kaleidoeye.com. For the month of November only, I’m offering a special rate of $7.99 (plus shipping and handling).